Making ratatouille in winter may sound perverse but when the ingredients are seasonably available in the summer the last thing you really want to do is spend the afternoon in the kitchen standing over a hot stove. But now as the days are shorter and the cold weather keeps us indoors, standing over a hot stove is much more appealing. So I am making Ratatouille today! I know I am bucking the trend for sourcing locally but in fact I will be using basil and parsley grown on my own windowsill even though the eggplant and zucchini are imported and the tomatoes come from a tin! 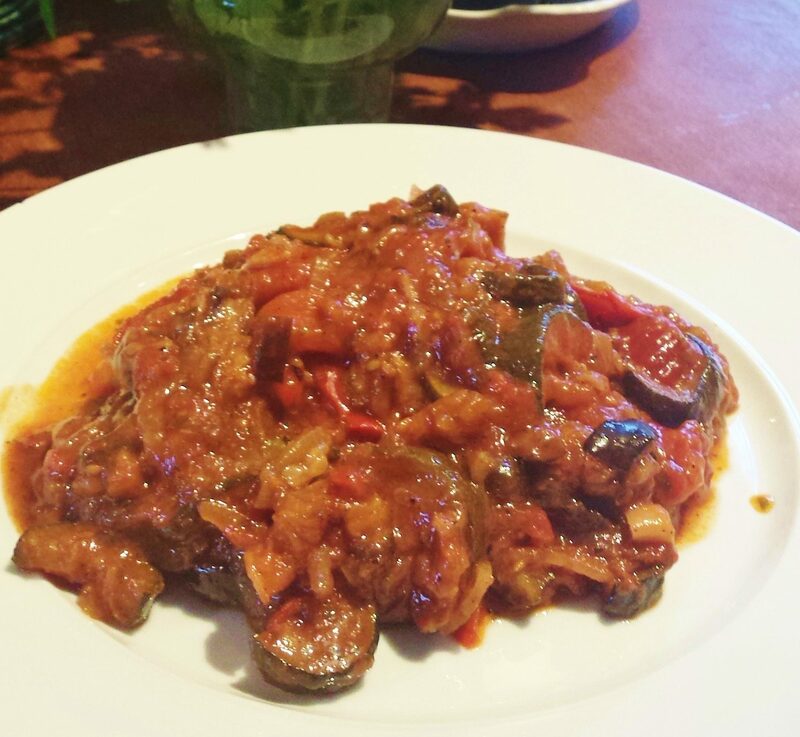 Everyone has a recipe for ratatouille or a similar type of long slow braised vegetable dish. This one is probably not dissimilar but the one difference is Adrienne always insisted that each vegetable must be sauteed separately because each one has different properties. The zucchini is full of water which it will exude while cooking. The eggplant will absorb all the oil in the pan before eventually releasing it and browning. The onions and garlic are cooked together before adding the tomatoes and their juice. Finally at the end everything is combined and simmered slowly along with the basil, parsley and most importantly a good dash of vinegar. Adrienne is a big proponent of using vinegar to cut the sweetness of certain vegetables especially when they have been slow cooked. You will find that it is an undercurrent in most of the recipes here. Making ratatouille is best done with a group of friends or family to help with the chopping and cooking. It can be frozen and is a wonderful treat in the middle of winter. 6 lbs. small sized green zucchini and yellow summer squash, cut in ¼ “slices. Step 1 Part 1: Heat olive oil in a large heavy bottomed pan that will ultimately hold all the vegetables and has a cover. Sauté the onions until they color slightly. Add the garlic and stir together. Allow to simmer for two minutes. Add the remaining ingredients (include the tomato sauce the tinned tomatoes are packed in) and simmer gently for an hour. If you are using fresh tomatoes, they will need to cook longer than the tinned ones. Step 2 Part II: Sauté the vegetables in batches in the olive oil with lots of salt and pepper. Don’t mix them together while sautéing them. I usually have two large sauté pans going at the same time on the stove. One is for the squash. Because it is so full of water you must not crowd the pan or they will steam. When they are lightly browned on both sides remove to drain on paper towel. Step 3 The other pan is for the eggplant. They are also full of water but you will find that they absorb all the liquid in the pan when you first put them in and then as they continue cooking they release the oil back into the pan. Don’t be tempted to pour more oil in until they have started to release what they have absorbed. When they are nicely browned on both sides remove to drain on paper towel. Step 4 When you have finished with the squash or eggplant clean the pan and cook the peppers in a bit less oil so they scorch a bit. Just before they are finished deglaze the pan with the wine and let them cook in the wine for five minutes. Step 5 Now you combine the vegetables with the tomato and onions from Part I and add half of the chopped basil and parsley. Cook over very low heat for an hour or more. Taste for seasoning and add two tbsp. of vinegar. Allow to simmer for a few minutes and taste again. You may need an additional tbsp. The vinegar helps to balance the sweetness of the vegetables. Step 6 Ratatouille is meant to be served room temperature in summer but in winter I love it hot. Either way add the remaining chopped parsley and basil before serving.